First of all my apologies for my last post about the pillows. It was supposed to go online yesterday evening but I was simply too tired for it. So the story is about yesterday (Sunday). I understood there was some confusion about the timeframe, so therefore, I’m sorry. Today the saga of the bathroom continues. Koen came in a bit later today as he was trapped in a traffic jam on the road. He did bring in the wood for the toiletbox but forgot the little strips of wood to fix it to the wall. No problem there, he needs 2 days to tile the walls so that bit he will take in tomorrow to fix the box and tile it over. The guy has been working like a machine and a big part of the room is now tiled with nice new white tiles. The tiles come in pack of 20 and to prevent the tiles from scraping over each other, which can cause damage to the surface, they have some kind of glue/sticker in between each tile. Some of those bits come off quite easy, most of them done. Koen complaint that his nails started to chip from scratching the glue of the tiles, so I offered to remove it later that evening with a glass scraper. Allthought it was not to difficult to remove, I noticed the flaky bits become very static and every time I managed to get it of the tiles, it fell down a short bit, just to stick to the tiles lower on the wall. Not a real success in other words. Tomorrow I’ll scrape it off the tiles before they go on the walls, so I will sit with him for a while doing that. He will built the toilet box and tile the rest of the room. If everything goes to plan, he will be able to do the floor on Wednesday, wash the tiles in on Thursday, built up the cubicle and the sink unit on Friday. Finally on Saturday he will return with the plumber to fix the taps and the toiletpot and we can shower again on Saturday evening. Lee thought it might be a better idea to wait another day with that but if Koen is saying we can use the shower again on Saturday evening, I am NOT gonna wait a second longer. 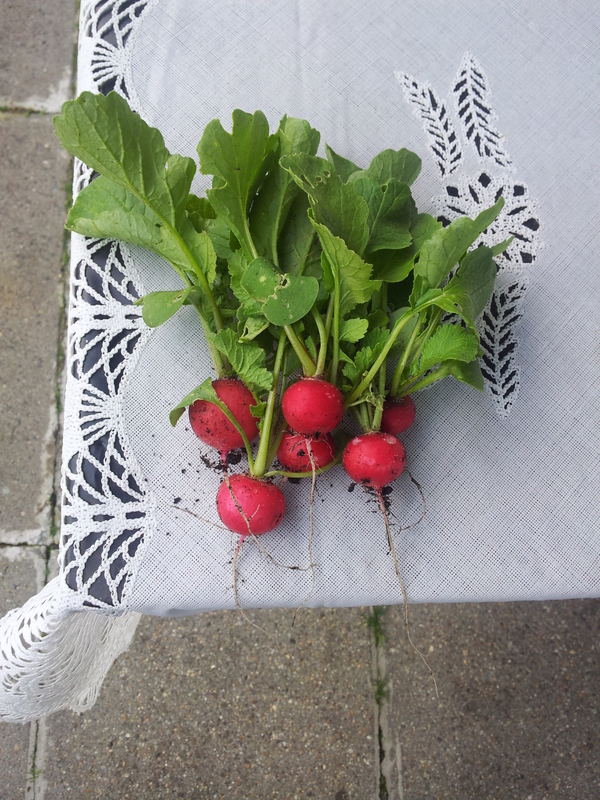 Today I’ve also harvested some of my radishes and used them in the salad. It’s not much but keep in mind that my veggie plot is only 2 square meters. This entry was posted in House DIY, What's happening and tagged bathroom, garden, home, vegetable. Bookmark the permalink.